This was written by John Nichols. 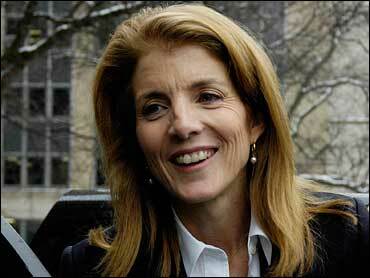 Never having sought or held public office, Caroline Kennedy is something of a political blank slate. But as she competes, aggressively, for the soon-to-be-vacant New York Senate seat of Hillary Clinton, who will leave to become President-elect Barack Obama's Secretary of State, Kennedy is doing the right thing. She's talking about where she stands on the issues. Senators should never be appointed. But if we must continue with the practice of allowing governors -- as opposed to special-election voters -- to fill empty seats in the chamber, those who seek appointments should at least let the people know where they stand. So what do we know about the daughter of former President John Kennedy and the niece of Massachusetts Senator Edward Kennedy, the liberal lion of the Capitol? Caroline Kennedy is aligning herself with her uncle Ted. In answers provided in recent days to questions from various media organizations, she has signaled that she "always" opposed the war in Iraq and "supports President-elect Obama's plan to work with our military leaders to begin a responsible withdrawal." That's a bit of a deviation from the line taken by Clinton, who supported authorizing President Bush to attack Iraq. But Kennedy's generally cautious with regard to foreign policy; for instance, she echoes Clinton's relatively uncritical view of Israeli government actions with regard to Palestinian proposals for resolving conflicts over issues such as the status of Jerusalem. Specifically, her camp tells The New York Times: "Caroline supports a two-state peace solution for Israel, so long as there is a true partner for peace in the Palestinians, and so long as Israel's security is assured." Domestically, however, Kennedy errs to the left. She "supports full equality and marriage rights for gay and lesbian couples." She embraces the Supreme Court's Roe v. Wade decision in 1973. She is no fan of school vouchers. She is a proponent of proposals to aid the auto industry -- a smart move in a state that still has a number of auto parts plants. She favors legislation that will make it easier for unions to organize. And she expresses reservations about free-trade initiatives. Kennedy's camp tells the Times: "Caroline believes that NAFTA has had unintended, negative consequences in some regions of New York, and that is why she agrees with President-elect Obama that we need to take a careful look at the agreement and pay particular attention to its impact on jobs and wages in American manufacturing communities. She also believes that we must ensure that American communities and workers benefit as we craft new trade agreements." That's a bit deviation from Clinton, and a good one. Does any of this mean that Caroline Kennedy will be a great senator? But the signals are generally encouraging. And the most encouraging signal of all is that she is, in a fashion, campaigning -- as those who seek senate seats should.